I was in the mood for a light vegetable soup and started off by looking at the inventory in my refrigerator: broccoli, onions, carrots, and cream. I can already envision the soup that I was about to make. After a quick search on google, I decided on this recipe from the food network. It was quick and easy. I was enjoying my bowl of joy in half an hour. The homemade croutons is a must. So don't skip this keep ingredient. My husband thought that this was "too light" for him, so I sprinkled some cheddar cheese in his bowl to make a cheese and broccoli soup. He was quite a happy camper after that little addition. Melt 4 tablespoons butter in heavy medium pot over medium-high heat. Add broccoli, onion, carrot, salt and pepper and saute until onion is translucent, about 6 minutes. Add the flour and cook for 1 minute, until the flour reaches a blonde color. Add stock and bring to boil. Simmer uncovered until broccoli is tender, about 15 minutes. Pour in cream. With an immersion blender, puree the soup. Add salt and pepper, to taste, and then replace the lid back on the pot. 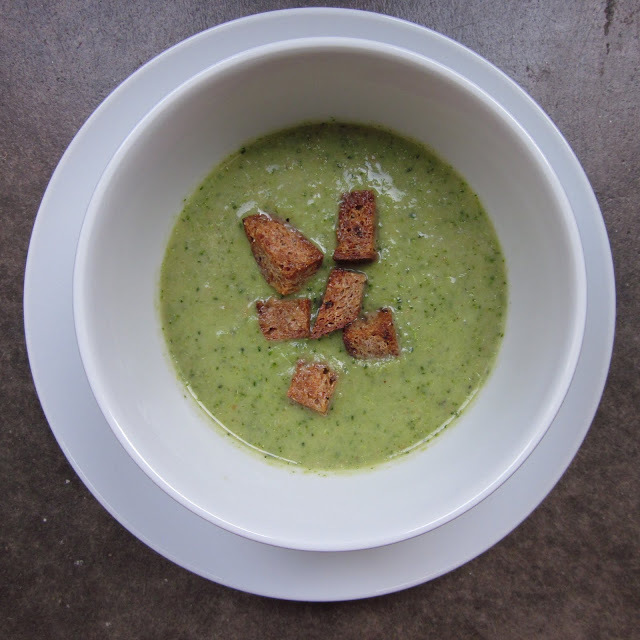 Serve hot with Homemade Croutons. Cut bread into cubes and place in a large bowl. Drizzle cubes with olive oil, salt, pepper, basil and garlic powder. Mix well. Spread seasoned bread onto a sheet pan and bake for about 15 minutes.